I think we’ve all heard that age-old bar joke: “What happens when you stick a translator, veterinarian, physicist, and an economist on a blog?” You haven’t heard that one? Obviously, you need to drink more bourbon at dirtier bars. Anyways, I’ll spoil the punchline for you which is: Taste of Croatia. If you haven’t heard of them yet, this four person core team of: Morana, Lada, Goran, and Marinela have, for some time now been covering the vast Croatian gastronomic scene. This is no small feat given that the geography of the country is diverse and when it comes to food and wine, there is a lot to take in from all the different influences that have crossed the borders. It began by putting out updates to their very popular Facebook page. Then, they started up the website and app (for Android & Apple iOS) at the same time, putting out excellent, high quality content about the country. Despite having followed the wine scene for the last decade or so, I’m always pleased to find articles about new places I wasn’t aware of, which goes to show the huge value in having local writers talk about their country. Speaking of local, their logo is something of an inside joke. Non-Croatians might look at it and think, “Why the hell does this red square have a bite taken out of it?” But, for those of us who have a Croatian passport, we know this square well as its part of the šahovnica, the main part of the Croatian coat of arms for a good 500 years. Just watch any international Croatian football match and you’ll see a good dose of this red and white checkerboard in the stadium. Once you know this, it’s really quite clever. 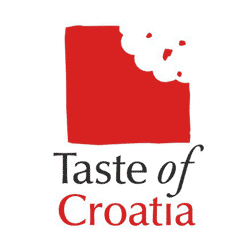 As Taste of Croatia is their baby and they don’t have some fancy Silicon Valley venture capitalist funding it, they’re looking to grow the project and make it self-funding. Given that the current food and wine scene in Croatia has been getting a good deal of attention lately, they’re in a very good spot to take it to the next level. What is that next level? After talking with Lada and Goran in Zagreb last month, they said it’s going to be a mix of a number of things including expanded reviews and possibly other items tied in to the main Taste of Croatia website. However it shakes down, if you’re a food and wine lover and you aren’t checking out Taste of Croatia daily, you’re definitely missing out.